Man and Woman: A Study of Secondary and Tertiary Sexual Characteristics was originally published in 1894. It proved to be one of Ellis’ most popular works and established his interest in sexology. Using data that he’d begun collecting 12 years earlier, Ellis examined whether attributes such as intelligence, hysteria, emotional capacity and artistic ability had their origins in sexual difference. 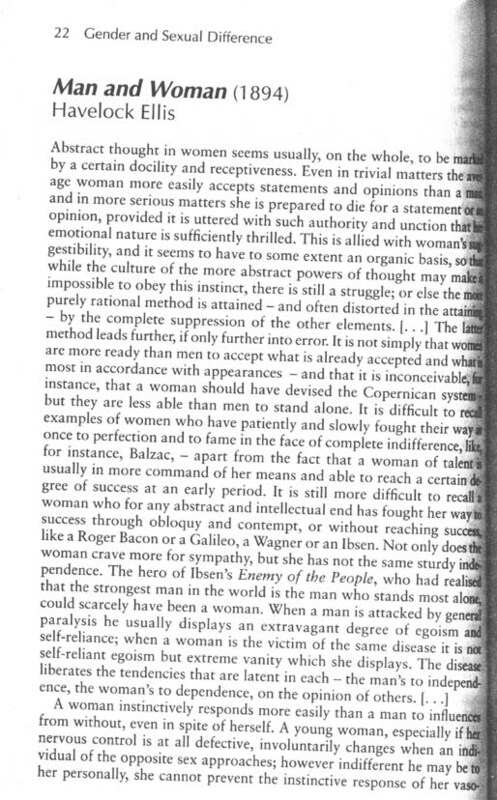 By grounding the study of gender in biology Man and Woman was very much of its time, as was Ellis’ suggestion of a perfect equipoise between male and female difference. This extract from Havelock Ellis’ 1894 publication, Man and Woman, is taken from L. Bland and L. Doan (eds), Sexology Uncensored: the documents of sexual science (London, 1998).